UK Home Office: 22 people banned from Britain for "stirring up hatred"
LONDON, England (CNN) -- Two Americans banned from entering the United Kingdom because the government feels they have been "stirring up hatred" responded by slamming the country's home secretary, and one of them threatened to sue her. 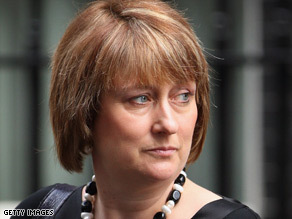 Jacqui Smith said she did not hesitate to name and shame those who foster extremist views. Radio talk show host Michael Savage and the anti-gay Rev. Fred Phelps were listed Tuesday among white supremacists and radical Islamic clerics who will not be allowed into the country. Savage, whose conservative daily show can be heard on radio stations across America, lashed out in an audio clip on his Web site and devoted seven stories on his main page to the ban. He is listed under his real name, Michael Alan Wiener. Britain's Home Office said it decided to exclude the 22 people on the list after measures by Home Secretary Jacqui Smith last year targeting people "who have engaged in spreading hate." According to the British Home Office, Savage is on the list for "seeking to provoke others to serious criminal acts and fostering hatred which might lead to inter-community violence." Smith said she is determined to keep those who "spread extremism, hatred and violent messages" out of the country. "Coming to the UK is a privilege, and I refuse to extend that privilege to individuals who abuse our standards and values to undermine our way of life," Smith said. "Therefore, I do not hesitate to name and shame those who foster extremist views, as I want them to know that they are not welcome here. The Home Office named only 16 people on the list, saying it was not in the public interest to disclose the names of the other six. Savage called Smith a "witch" in the audio clip and asked why six names on the list weren't released. He also questioned why North Korean leader Kim Jong Il and Venezuelan President Hugo Chavez didn't make the list. Savage said he has seven attorneys working on a defamation lawsuit against Smith and encouraged his listeners to call off any travel plans to England and boycott all British products. Savage's show is not syndicated in England. The outspoken Kansas Rev. Fred Phelps and his daughter, Shirley Phelps-Roper, also made the list for "engaging in unacceptable behavior and fostering hatred." Phelps did not issue a response on his Web site. However, the site linked to a British news story on the ban and the link called Smith a "neo-Nazi dyke" and "filthy God-hater." Phelps and his followers at Topeka's Westboro Baptist Church oppose homosexuality. They picket the funerals of soldiers killed in Iraq, saying their deaths are God's way of punishing the United States for supporting homosexuals. They have expressed similar views about the victims of the September 11, 2001, attacks and Hurricane Katrina. The church's slogan is "God Hates Fags." • Former Ku Klux Klan Grand Wizard Don Black, who established the white supremacist Web site Stormfront, which the Home Office called one of the oldest and largest hate group sites. • Eric Gliebe, chairman of the National Alliance, one of the largest neo-Nazi groups in the United States. The Home Office accused Gliebe of "justifying terrorist violence, provoking others to commit serious crime and fostering racial hatred." • Samir al Quntar, a Lebanese man who spent three decades in prison for killing four Israeli soldiers and a 4-year-old girl in 1979. Al Quntar is listed for "engaging in unacceptable behavior by seeking to foment, justify or glorify terrorist violence" in order to provoke terrorist acts, the Home Office said. • Nasr Javed, a leader of the Kashmiri militant group, Lashkar e Taiba. • Islamic clerics Abdul Ali Musa, Abdullah Qadri Al Ahdal, Amir Siddique, Yunis Al Astal and Safwat Hijazi. • Wadgy Abd El Hamied Mohamed Ghoneim, whom the Home Office describes as a prolific writer and speaker. The Home Office said he has sought "to foment, justify or glory terrorist violence in furtherance of particular beliefs and to provoke others to commit terrorist acts." • Mike Guzofsky, the leader of a militant Jewish group who also has ties to Kahane Chai, a group that the U.S. State Department lists as a foreign terrorist organization. • Russian skinheads Artur Ryno and Pavel Skachevsky, whom the Home Office said are "leaders of a violent gang that beat migrants and posted films of their attacks on the Internet."